Can you imagine participating in a protest outside the White House and forcing the entire U.S. government to resign? Can you imagine a group of randomly chosen private citizens rewriting the U.S. constitution to include measures banning corporate fraud? It seems incomprehensible in the U.S., but Icelanders did just that. 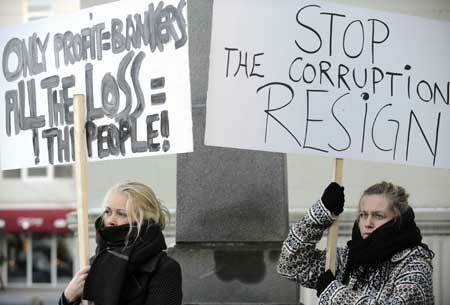 Icelanders forced their entire government to resign after a banking fraud scandal, overthrowing the ruling party and creating a citizen’s group tasked with writing a new constitution that offered a solution to prevent corporate greed from destroying the country. The constitution of Iceland was scrapped and is being rewritten by private citizens; using a crowd-sourcing technique via social media channels such as Facebook and Twitter. These events have been going on since 2008, yet there’s been no word from the U.S. mainstream media about any of them. In fact, all of the events that unfolded were recorded by international journalists, overseas news bureaus, citizen journalists and bloggers. This has created current accusations of an intentional cover up of the story by mainstream U.S. news sources. An “iReport” on CNN, written by a private citizen in May 2012, has questioned the reasons why this revolution has not been widely covered in the U.S., suggesting that perhaps the mainstream media is controlled by large corporate interests and thus has been unwilling to report on Iceland’s activities. That report is currently making its way around social media. CNN today placed a statement on its website saying: “We’ve noticed this iReport is being shared widely on Facebook and Twitter. Please note that this article was posted in May 2012. CNN has not yet verified the claims and we’re working to track down the original writer.” It is interesting to note that CNN’s European version, CNN Europe, already covered the story of the protests and the government’s resignation, leading many to question why CNN would now need to “look into” the claims. As with most narratives, the truth may lie somewhere in the middle of all of these varying perspectives. 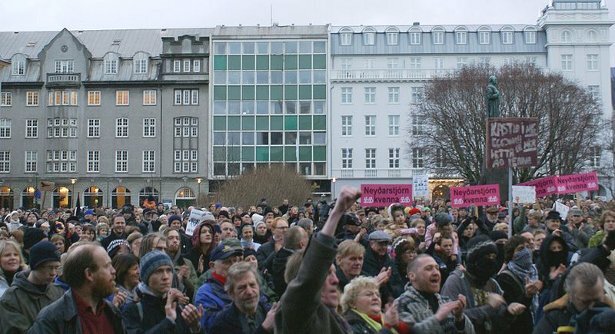 One thing is clear, though: it’s nearly impossible to find one mainstream U.S. news report of the pots and pans revolution in Iceland, the resignation of Iceland’s entire government, and the jailing of the bankers responsible for the economic collapse there. Whether or not the revolution led to a more fair government or a workable and effective constitution is irrelevant to the fact that the U.S. media has essentially skipped over this story for the past five years. Is it possible that mainstream media sources purposely covered up the Iceland story to appease their corporate sponsors? It doesn’t seem likely, and yet, what explanation could be given as to why this news never made it to the front pages of our most trusted media organizations here in the U.S.? As Iceland struggles to regain its footing with a new government, U.S. citizens may or may not be able to look to Iceland as an example of perfect democracy in action. The real question, though, is why weren’t U.S. citizens given the information about the ousting of the Icelandic government and the jailing of the unscrupulous bankers? Are journalists in control of the mainstream media or is there some truth to accusations that big business may, in fact, be strong-arming reporters to keep quiet about world events that could inspire similar actions here in the U.S.?